The Samsung Galaxy Note 3 is an NFC-enabled handset with a 5.7-inch full HD Amoled display and a 13 megapixel camera capable of capturing 1080p video at 60 frames per second. The Note 3 includes an updated version of the S Pen stylus that can operate a new Air Command feature to give quick access to a palette of tools including scrapbooking, memo writing and multi tasking. 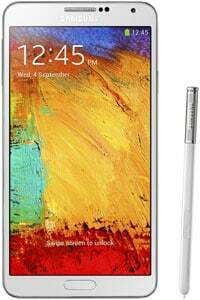 Announced on 4 September 2013, the Note 3 is now available worldwide.